Use snippets of greenery from your garden—yew, spruce, pine, or anything you have handy—to craft this wreath with a message. 1. 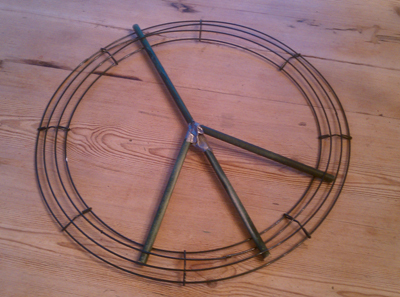 Purchase a simple wire form from a hobby or floral shop. Form the peace sign by spray painting a dowel (about 1/2-inch thick) dark green and cutting it to form the inside of the peace sign. Duct tape into place as needed. You can also push the dowels tightly into place, braced against the wires of the form. 2. Cut short lengths of greenery about 2 to 4 inches long. Wire the cut ends tightly together, and wire to the form with a length of floral wire. Then use a length of floral wire to wire the ends in place, following the curve of the wreath. Repeat, overlapping the lengths. 3. 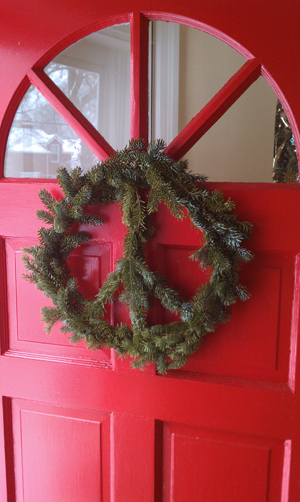 When done, step back and look at the wreath. If portions of the greenery are poking out too much, use a length of wire to wire them closer to the form. 4. If desired, make a short loop of floral wire from which to hang the wreath. Helpful hint: If sap gets on your hands or tools, use any type of oil—baby, olive, vegetable—and a dry rag or paper towel to rub it off.